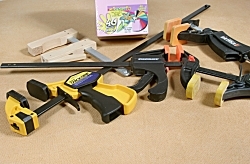 For quick and easy positioning and moving of jigs and templates, quick-release clamps, e.g. Solo, are very useful. They are inexpensive, especially at shows, and are operated with one hand leaving the other to move the jig. 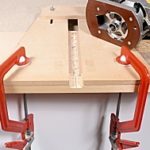 If it’s important not to mark the workpiece, you can use soft-jawed clamps. Some are based on removable plastic jaws; others, such as the Klemmsia, have cork facings to the clamp jaws. The Klemmsia are for light use only and are tightened by means of a cam lever. With most of the plastic-jawed clamps, you get the double benefit of soft jaws and one-hand operation. In the absence of soft-jawed clamps you can make suitable pads by cutting pieces from thin foam sheet. This material is available from craft shops and household stores. Shown above are several versions of soft-jawed clamps plus a pack of foam sheets bought from a local high street chain store. 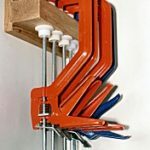 Your most frequently-used clamps should be stored within easy reach of your workstation. I keep my quick-release clamps mounted on a softwood bracket made from a length of 50 x 75mm timber let into a piece of 25 x 75mm board. The bracket is attached to the outside of a wall cupboard just behind my normal working position. Attachment is by screws driven from inside the cupboard. Here you can see several clamps stored on the bracket. We never seem to have enough clamps. A good way to accumulate them is to buy a few whenever you go to a woodworking show. There are nearly always suppliers using clamps as their special show offers and you can build up a collection at bargain prices. With some shows, the amount you save on buying clamps will pay for your admission, or at least justify the time taken to visit the show.